I unexpectedly came across some fresh apricots at the greengrocer’s the other day, and even though I have a ton in the freezer and more in jars, I couldn’t resist buying some. We’ve eaten so much apricot clafoutis recently that even though it’s delicious and easy, I decided to make a bit more effort this time. It’s not pastry-making weather, but a root around in the freezer produced a slab of pâte sucrée (sweet pastry), so away I went. This tart is quite a lot of work if you have to make the pastry too, but the results are excellent, and it’s ideal for a summer party. Serve warm or at room temperature, with crème fraîche or ice cream. Preheat the oven to 190C. Roll out the pastry and use it to line a 20 cm tart tin, preferably one with a loose bottom. Note, my pastry recipe is quite hard to handle. If it falls apart when you try to roll it out, just make the best of it and line the tin patchwork-fashion, dampening the edges of the pieces and pressing them together). Ideally, put it in the fridge for half an hour. Put a piece of greaseproof paper or foil on top of the pastry, and cover with blind baking beans. Bake for about 6 minutes, then remove paper and beans, bake for another 6 minutes, then set aside to cool. The pastry should be dry but only very lightly coloured — it will cook more later. To make the frangipane cream, just put all the ingredients in a food processor and whiz to blend — it should be a thick but not stiff paste. For the apricots, dissolve the sugar in the water in a wide pan, by heating gently until it boils. While that happens, halve the apricots and discard the stones. Reduce heat to a simmer, add the apricots to the pan in a single layer, cover, set the timer for 4 minutes, and do not go away. It takes only seconds for the poached apricots to dissolve into a mush, and they will if you turn your back. They should be tender but still whole (it doesn’t matter if one or two collapse). If yours were very hard they might need a minute or two more, but be vigilant. Use a slotted spoon to remove them from the pan and place on a large plate or tray to drain. You can save the syrup and use it for sorbet. To assemble the tart, spread the frangipane over the pastry. then carefully arrange the apricot halves cut side down in concentric circles, handling them gently. You can use any mushy ones to fill gaps. Preheat the oven to 180C, and bake for 40-45 minutes, until the frangipane is set and the pastry is lightly golden. 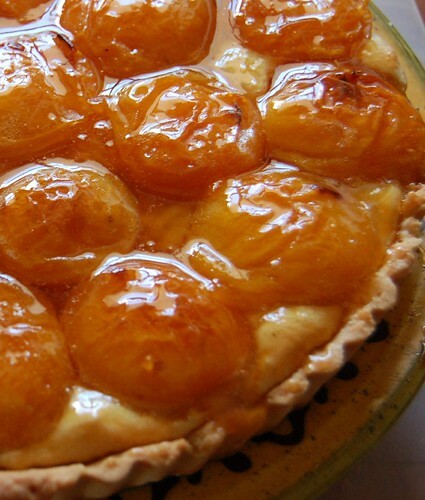 Remove the tart from the oven, and while it’s still hot, brush with apricot glaze, made by heating sieved good-quality apricot jam with a tablespoon or so of water or amaretto. Leave to cool, and serve with crème fraîche or ice cream. 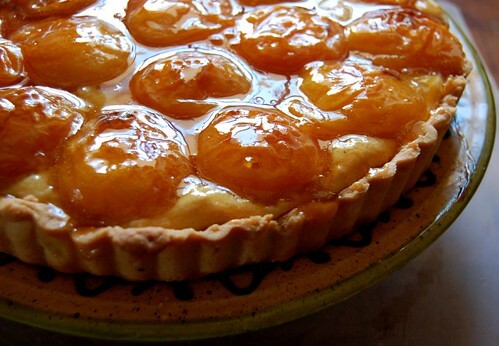 I have just made 2 small tarts, had a basket of apricots in fridge. Neve made frangipane before! turned out bautiful, very proud of myself. Thank you for helping me with those nearly 8 pounds of apricots I had no idea how to cook – clafoutis is good, but it can get a bit… tiresome after a while. Also your frangipane recipe is easier and yummier than all the others I have come across. At last, a recipe that really is as yummy as it sounds! Hi. This dessert in amazing, thank you. You mentioned you have apricots in the freezer, was hoping to do this, so can make this out of season. Would frozen apricots be ok for this dessert? And if so, do you just half, stone and then freeze? Yes, that’s what I do. Spread the halves on a tray and open-freeze them, then pack in boxes with paper between the layers to stop them sticking together. You can only use them in cooked dishes as they’ll go a bit mushy when thawed. Glad you enjoyed this tart, it’s one of my favourites too! thanks for your reply. once the apricots are defrosted do you still cook them in the syrup before putting them on the tart, or would this make them too mushy? My only other thought was doing the syrup stage before freezing (as i know a lot of people store apricots in syrup with a bit of ascorbic acid for freezing)? Yes, I was actually going to suggest you poach them first, very lightly, and freeze in the syrup. Because they do tend to be mushy when you defrost them, even uncooked. Thanks for sharing what sounds like a great receipe and just what I need. What I’m not sure about is whether the oven temperatures and times are for fan oven or conventional oven? They are for a conventional oven, so you can reduce them a bit if using a fan oven. It’s not too critical — just keep an eye on it so it doesn’t overcook. Thank you for this recipe. My husband is French and he loves this apricot tart. I put 1 egg, and the tart is softer. I’m glad you enjoyed it, Nadia! Thanks for the comment. This was delicious. My local store had amazingly ripe and fragrant apricots which made this tart simply divine. Thanks for the recipe I’ll make it again and again!! Delicious-doubled the recipe (used my own butter pastry) and easily served 10-12 people. For those of us who are metric challanged, took a little time for conversion! But worth it. Thanks Patricia! I’m glad you enjoyed it. Délicieux, thank you for this recipe. A lovely way to enjoy apricots at their peak in summer.